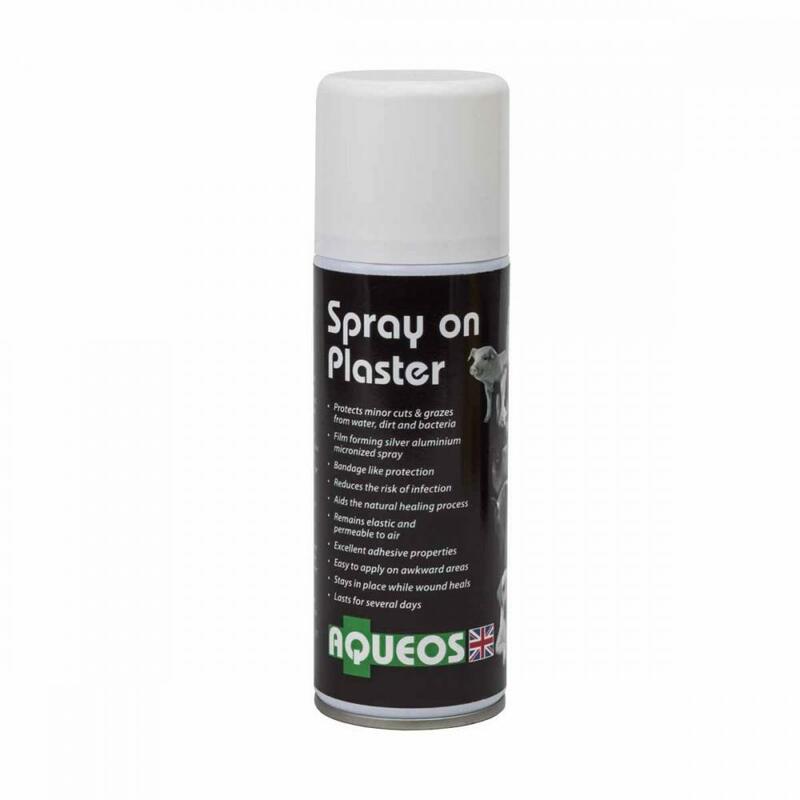 Aqueos Spray On Plaster helps to protect minor cuts and grazes from dirt, water and bacteria. It provides a film which forms a silver aluminium micronised bandage like protection. Spray On Plaster reduces the risk of infection and aids the natural healing process. Remains elastic and permeable to air. Excellent adhesive properties, stays in place while wound heals. Easy to apply in awkward areas. Below are some recent questions we've received regarding Aqueos Spray On Plaster, including answers from our team. Can this be used on dog paws? My dog has started getting sores on his paws, my vets advice is to walk him on lead, to return if becomes infected, that's it. So I've decided to bathe his paws in a shallow Epsom salt bath, been doing that twice a day for the last 2 days, I dry and put f10 on, tape cotton wool pads to his feet and bandage his paws. In the evening after his Epsom and f10 treatment I do not bandage them. I am not allowing him out other than to go to the toilet (He wears balloon shoes) and plan to see how his paws are in a week to see if we can start going out properly. At that point I'll want some extra protection for his then very pamperd paws, without bandages, tape or shoes. And if not do you know what would be suitable? It sounds like you are doing all the right things and his paws should make a full recovery soon. The stick on plaster would help to give additional protection and reduce the risk of infection, so we would advise giving it a try. Hi violet my dog has a wound to his tail from whipping it al the time, is it safe to use a spray plaster on his wound and is it non toxic if he licks it? This should be perfectly safe and will be a help, but a wound on the tip of the tail of a dog is the classic situation where it goes on for months and never gets the chance to heal. This is worse in dogs with a very short coat, which may or may not apply to your dog. It is fine to use the spray, but you might also need to try and prevent further damage caused by him bashing it on walls etc all the time. A carefully applied bandage can help sometimes, but it is very skilled to get this to stay on while not causing damage by restricting the blood supply. If in doubt, you should see your vet.